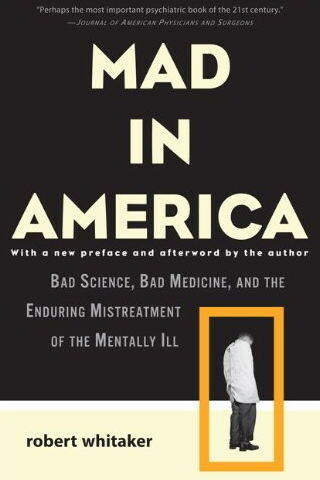 The following materials are designed to complement the sources cited in Mad In America: Bad Science, Bad Medicine and the Enduring Mistreatment of the Mentally Ill. They are grouped here around a few key topics, rather than chapter by chapter. Nor are the sources here meant to be comprehensive in scope. The information on this web site is provided as supplemental resource material to the book. During the early 19th century, a form of care was practiced, known as moral treatment, that emphasized treating the "insane" with kindness and empathy. It was believed that a supportive environment could help heal people who were mentally disturbed. Historians who have reviewed records from the early moral-treatment asylums have concluded that it was surprisingly effective. More than 50% of the "newly insane" recovered within a year's time, and many remained well the rest of their lives. The best long-term study of the time found that only one-third of newly insane patients who received moral treatment became chronically ill; nearly all the others recovered at some point and fared fairly well over the long term. J. Sanbourne Bockoven, Moral Treatment in Community Mental Health (Springer Publishing Company, 1972), 10-19; 55-67. Andrew Scull, Social Order/Mental Disorder (University of California Press, 1989), 54-79, 90. Andrew Scull, "Moral Treatment Reconsidered," Psychological Medicine, 9 (1979), 421-428. Gerald Grob, Mental Institutions in America: Social Policy to 1875 (Free Press, 1973), 68. Gerald Grob, The Mad Among Us (Harvard University Press, 1973), 36, 99-102. Thomas Morton, History of Pennsylvania Hospital (Times Printing House, 1895), 172, 243. Norman Dain, Concepts of Insanity in the United States, 1789-1865 (Rutgers University Press, 1964), 120, 132. For an in-depth look at moral treatment, see Nancy Tomes, The Art of Asylum Keeping (University of Pennsylvania Press, 1994). The history of 20th century medical treatments for the severely mentally ill in America cannot be understood without first understanding the societal attitudes toward the mentally ill that arose in the first half of the 20th century. The eugenics movement devalued the mentally ill, and it was this devaluation that set the stage for the use of "brain-damaging" therapeutics in the 1930s and 1940s, a legacy that continued with the introduction of "anti-psychotic" drugs in the 1950s. For a broad overview of the eugenics movement in the U.S., see Daniel Kevles, In the Name of Eugenics (University of California Press, 1985), and Allan Chase, The Legacy of Malthus (University of Illinois Press, 1980). Chase is much more critical than Kevles in his review of America's role in nurturing this movement. The leaders of the eugenics movement in the U.S. came primarily from elite Ivy League universities. The American Eugenics Society's advisory council was composed of numerous leaders within the American scientific community. See Barry Mehler, in A History of the American Eugenics Society, 1921-1940, Ph.D. thesis, University of Illinois at Urbana-Champaign, 1988. There has been a relative dearth of reporting on the tie between American eugenicists and German eugenicists. However, in the 1920s, German eugenicists looked to America as the leader in this "science," and obtained funding from The Rockefeller Foundation to pursue their research. This common bond between American eugenicists and Germany eugenicists became quite clear in 1933, when Hitler and his Nazi party passed a bill that called for the forcible sterilization of the mentally ill. The Nazi sterilization bill was widely praised in the U.S. as a progressive health measure. The New England Journal of Medicine, the American Public Health Association and the New York Times were just a few of the mainstream organizations that voiced their support of the Nazi bill. American eugenicists were particularly enthusiastic about the Nazi legislation. In addition to citations given in Mad In America, the following sources detail this link between Germany and American eugenicists. "Sterilization and its Possible Accomplishments," editorial, New England Journal of Medicine, 211 (1934), 379-380. "The Problem of Human Sterilization," editorial, JAMA 102 (1934), 1610. William W. Peter, "German Sterilization Program," American Journal of Public Health, 24 (March, 1934), p. 187-191. Andre Sofair, "Eugenical Sterilization and a Qualified Nazi Analogy: The United States and Germany, 1930-1945," Annals of Internal Medicine, 132 (February 15, 2000) 312-319. H.H. Laughlin, "Eugenics in Germany," Eugenical News, 22 (July-August, 1937), 65. Paul Popenoe, "The German Sterilization Law," Journal of Heredity, 25 (July 1934), 257-260. Clarence Campbell, Presidential Address at the 24th Annual Meeting of the Eugenics Research Association, 1936, Eugenical News, 21 (March/April, 1936), 25. Frederick Osborn, "Summary of the Proceedings" of the Conference on Eugenics in Relation to Nursing, 2/24/37 AES papers, as cited by Mehler, ibid, 223. "Eugenical Sterilization in Germany," Eugenical News, 18 (Sept./Oct., 1933) 89-93. Randall Bird, "The Papers of Harry Hamilton Laughlin, Eugenicist," Journal of the History of Biology, 14 (1981), 352. Margaret Smyth, "Psychiatric History and Development in California," American Journal of Psychiatry, 94 (1938), 1234. There is a clear trail of studies in the research literature documenting the fact that neuroleptics increased the likelihood that people would become chronically ill. See the book, Mad In America for an explication of why this body of research was ignored. Leon Epstein, [PDF] An Approach to the Effect of Ataraxic Drugs on Hospital Release Rates, American Journal of Psychiatry, 119 (1962), 36-47. This was the first large scale study of hospital release rates in the 1950s for schizophrenia patients treated with and without neuroleptics, and it concluded that "drug-treated patients tend to have longer periods of hospitalization." Nina Schooler, [PDF] One year after discharge: community adjustment of schizophrenic patients, American Journal of Psychiatry, 123 (1967), 986-995. This NIMH study looked at one-year outcomes for 299 patients who had been treated either with neuroleptics or placebo upon their admission to a hospital, and was the first long-term study conducted by the NIMH. The researchers found that "patients who received placebo treatment in the drug study were less likely to be rehospitalized than those who received any of the three active phenothiazines (thioridazine (Mellaril), fluphenazine (Prolixin), chlorpromazine (Thorazine)." However, in spite of this finding, which the researchers wrote "was so unexpected," the NIMH investigators stated that they "were unprepared to recommend placebo as treatment of choice." In other words, the NIMH researchers decided they wouldn't develop treatment guidelines based on their own research, which found that placebo patients did better than the drug-treated patients. Robert Prien, [PDF] Relapse in Chronic Schizophrenics Following Abrupt Withdrawal of Tranquillizing Medication, British Journal of Psychiatry, 115 (1968), 679-86. The critical finding of this NIMH study was that relapse rates rose in direct relation to dosage--the higher the dosage patients were on before the drugs were withdrawn, the greater the relapse rates. At the start of the study, 18 patients were on placebo, and only one got worse over the next six months (6%). Sixty-five patients were on 300 mg. of chlorpromazine at the start of the study, and 54% of these patients worsened after the drug was withdrawn. One hundred thirteen patients were on more than 300 mg. of chlorpromazine at the start of the study, and 66% of these patients got worse after drug withdrawal. Robert Prien, [PDF] Discontinuation of Chemotherapy for Chronic Schizophrenics, Hospital and Community Psychiatry, 22 (1971), 20-23. In this NIMH study, the earlier finding that relapse rates rose in correlation with neuroleptic dosage was confirmed. Only 2 of 30 patients who were on placebo at the start of the study relapsed during the next 24 weeks (7%). Twenty-three percent of the 99 patients who were on under 300 mg. of chlorpromazine at the start of the study relapsed following drug withdrawal. Fifty-two percent of the 91 patients who were on 300 to 500 mg. of chlorpromazine at the start of the study relapsed following drug withdrawal, and sixty-five percent of the 81 patients who were on more than 500 mg. of chlorpromazine at the start of the study relapsed following drug withdrawal. The researchers concluded: "Relapse was found to be significantly related to the dose of the tranquilizing medication the patient was receiving before he was put on placebo--the higher the dose, the greater the probability of relapse." J. Sanbourne Bockoven, [PDF] Comparison of Two Five-Year Follow-Up Studies: 1947 to 1952 and 1967 to 1972, American Journal of Psychiatry, 132 (1975), 796-801. In this study, Boston psychiatrists Sanbourne Bockoven and Harry Solomon compared relapse rates in the pre-drug era to those in the drug era, and found that patients in the pre-drug era had done better. Forty-five percent of the patients treated at Boston Psychopathic Hospital in 1947 had not relapsed in the five years following discharge, and 76% were successfully living in the community at the end of that follow-up period. In contrast, only 31% of patients treated in 1967 with drugs at a Boston community health center remained relapse-free for the next five years, and as a group they were much more "socially dependent"--on welfare, etc.--than those in the 1947 cohort. Other researchers who reviewed relapse rates for New York psychiatric hospitals in the 1940s and early 1950s reported similar findings: roughly 50% of discharged schizophrenia patients had remained continuously well through lengthy follow-up periods, which was markedly superior to outcomes with neuroleptics. See Nathaniel Lehrman, "A state hospital population five years after admission: a yardstick for evaluative comparison of follow-up studies," Psychiatric Quarterly, 34 (1960), 658-681; and H.L. Rachlin, "Follow-up study of 317 patients discharged from Hillside Hospital in 1950," J. Hillside Hospital, 5 (1956), 17-40. William Carpenter, Jr., [PDF] The treatment of acute schizophrenia without drugs: an investigation of some current assumptions, American Journal of Psychiatry, 134 (1977), 14-20. In this 1977 NIMH study, 49 schizophrenia patients, placed into an experimental hospital program that provided them with psychosocial support, were randomized into drug and non-drug cohorts. Only 35% of the non-medicated patients relapsed within a year after discharge, compared to 45% of those treated with medication. The medicated patients also suffered more from depression, blunted emotions, and retarded movements. Maurice Rappaport, [PDF] Are there schizophrenics for whom drugs may be unnecessary or contraindicted?, International Pharmacopsychiatry, 13 (1978), 100-111. In this 1978 study, Maurice Rappaport and his colleagues at the University of California, San Francisco randomized 80 young male schizophrenics admitted to Agnews State Hospital to drug and non-drug groups. Only 27% of the drug-free patients relapsed in the three years following discharge, compared to 62% of the medicated group. Most notably, only two of 24 patients (8%) who weren't medicated in the hospital and continued to forgo such treatment after discharge subsequently relapsed. At the end of the study, this group of 24 drug-free patients was functioning at a dramatically higher level than drug-treated patients. Susan Mathews, [PDF] A non-neuroleptic treatment for schizophrenia: analysis of the two-year postdischarge risk of relapse, Schizophrenia Bulletin, 5 (1979), 322-332. Loren Mosher, [PDF] Community residential treatment for schizophrenia: two year followup, Hospital and Community Psychiatry, 29 (1978), 715-723. Loren Mosher, [PDF] The treatment of acute psychosis without neuroleptics: six-week psychopathology outcome data from the Soteria project, International Journal of Social Psychiatry, 41 (1995), 157-173. Loren Mosher, "The Soteria project: twenty five years of swimming upriver," Complexity and Change, 9 (2000), 68-73. During the 1970s, the head of schizophrenia studies at the NIMH, Loren Mosher, conducted an experiment that compared non-drug treatment to drug treatment, and he reported better outcomes for the non-drug patients. Only 31% of the patients treated without drugs in the experimental program, and who remained off neuroleptics after leaving the program, relapsed over the next two years. Pavel Muller and Philip Seeman, [PDF] Dopaminergic Supersensitivity after Neuroleptics: Time-Course and Specificity, Psychopharmacology, 60 (1978), 1-11. Guy Chouinard, [PDF] Neuroleptic-induced supersensitivity psychosis, American Journal of Psychiatry, 135 (1978), 1409-1410. Guy Chouinard, [PDF] Neuroleptic-induced supersensitivity psychosis: clinical and pharmacologic characteristics, American Journal of Psychiatry, 137 (1980), 16-20. In the late 1970s, Canadian investigators identified the biological changes induced in the brain by neuroleptics that led to the higher relapse rates. Because the drugs dampen down dopamine activity, the brain tries to compensate by becoming "supersensitive" to dopamine. (The drugs trigger an increase in the density of dopamine receptors.) This perturbation in dopamine function makes the patients more biologically prone to psychosis and to worse relapses upon drug withdrawal. Chouinard concluded: "Neuroleptics can produce a dopamine supersensitivity that leads to both dyskinetic and psychotic symptoms. An implication is that the tendency toward psychotic relapse in a patient who has developed such a supersensitivity is determined by more than just the normal course of the illness . . . the need for continued neuroleptic treatment may itself be drug-induced." George Gardos and Jonathan Cole, [PDF] Maintenance Antipsychotic Therapy: Is the Cure Worse than the Disease, American Journal of Psychiatry, 133 (January 1976), 32-36. After discussing the problems with neuroleptics, the authors conclude, "every chronic schizophrenic outpatient maintained on an antipsychotic medication should have the benefit of an adequate trial without drugs." Jonathan Cole was the head of the NIMH, I believe, in the 1960s. This is just a general discussion paper, but note his conclusion: "An attempt should be made to determine the feasibility of drug discontinuance in every patient." Courtenay M. Harding Ph.D., and James H. Zahniser, [PDF] Empirical Correction of Seven Myths About Schizophrenia with Implications for Treatment, Acta Psychiatrica Scandinavica, 90 (1994), (suppl. 384): 140-146. Myth No. 5 in this paper is that "Patients must be on medication all their lives" with the reality being: "It may be a small percentage who need medication indefinitely." "Even in the second and third decades of illness, there is still potential for full or partial recovery." All of the recent long-term follow-up investigators have recorded the same findings. Courtenay M. Harding, Ph.D., George W. Brooks, M.D., Takamaru Ashikaga, Ph.D., John S. Strauss, M.D., and Alan Breier, M.D., [PDF] The Vermont Longitudinal Study of Persons With Severe Mental Illness, II: Long-Term Outcomes of Subjects Who Retrospectively Met DSM-III Criteria for Schizophrenia, American Journal of Psychiatry, 144 (June 1987), 727. See also [PDF] Vermont 1, American Journal of Psychiatry, 144 (June 1987), 718. James D. Hegarty, M.D., MP.H., Ross J. Baldessarini, M.D., M.P.H., Maricio Tohen, M.D., Dr. P.H., Christine Waternaux, Ph.D., and Godehard Oepen, M.D., [PDF] The One Hundred Years of Schizophrenia: A Meta-Analysis of the Outcome Literature, American Journal of Psychiatry, 151 (1994), 1409-1416. At the same time that the WHO was reporting on poor outcomes in developed countries, Harvard Medical School researchers published a study concluding that outcomes for schizophrenia patients in the U.S. had declined since the 1970s, to the point they were no better than they had been in 1900. They found that since 1986, only 36.4% of patients in the U.S. have had favorable outcomes (or were "improved" during a follow-up period that averaged 5.6 years.) The authors did not blame neuroleptic use for the poor outcomes; on the contrary, they argued that despite the poor outcomes in the modern era, neuroleptics still should be seen as beneficial, but this part of their conclusions is not supported with any research. Adele C. Viguera, M.D., Ross J. Baldessarini, M.D., James D. Hegarty, M.D., MPH., Daniel P. van Kammen, M.D., Ph.D., Marucio Tohen, M.D., Dr.PH., [PDF] Clinical Risk Following Abrupt and Gradual Withdrawal, Archives of General Psychiatry, 54 (Jan 1997). This study quantified the how much the abrupt discontinuation of long-term neuroleptic use increased relapse rates and concluded that the relapse risk was relatively high within six months; most patients who remained stable for 6 months continued to do so for long periods without medication; and the risk of relapse was lower when the medication withdrawal was gradually discontinued as compared to abrupt discontinuation. On page 52 Figure three shows that two-thirds of those gradually withdrawn haven't relapsed at the end of 24 weeks, and that after that, they have a good chance of remaining well indefinitely. Luc Ciompi, Hans Peter Dauwalder, Chistian Maier, Exixabeth Aebi, Karl Trütsch, Zeno Kupper and Charlotte Rutishauser, [PDF] The Pilot Project Soteria Berne; Clincial Experiences and Results. In this study, Switzerland researchers duplicate Mosher's results (more or less.) Note on page 148 conclusion that: "patients who received no or very low-dosage medication demonstrated significantly better results." Cullberg, J., [PDF] Integrating intensive psychosocial therapy and low dose medical treatment in a total material of first episode psychotic patients compared to "treatment as usual" a 3 year follow-up, Acta Psychiatrica Scandinavica, 83 (May 1991), 363-72. This is study from Sweden in which they copied the Finnish project. Note that only 45 of the patients in the experimental group were on neuroleptics at 3-year followup, and those on it were on 62 milligrams of Thorazine a day (a very low dose) and that this experimental group had much lower hospital use than those treated conventionally over a three-year followup. In other words, they did better, and this of course saves money. Chakos, Lieberman, Bilder, Borenstein, Lerner, Bogerts, Wu, Kinon and Ashtari, [PDF] Increase in Caudate Nuclei Volumes of First-Episode Schizophrenia Patients Taking Antipsychotic Drugs, American Journal of Psychiatry, 151 (October 1994), 1430-1436. Madsen, Keiding, Karle, Esbjerg and Hemmingsen, [PDF] Neuroleptics in progressive structural brain abnormalities in psychiatric illness, The Lancet, 32 (September 5, 1998), 784-785. Gur, Maany, Mozley, Swanson, Bilker and Gur, [PDF] Subcortical Volumes in Neuroleptic-Naive and Treated Patients with Schizophrenia, American Journal of Psychiatry, 155 (December 1998), 1711-1717. Selemon, Lidow and Goldman-Rakic, [PDF] Increased Volume and Glial Density in Primate Prefrontal Cortex Associated with Chronic Antipsychotic Drug Exposure, Biologic Psychiatry, 46 (1999), 171-172. Gur, Cowell, Turetsky, Gallacher Cannon, Bilker and Gur, [PDF] A Follow-up Magnetic Resonance Imaging Study of Schizophrenia: Relationship of Neuroanatomical Changes to Clinical and Neurobehavioral Measures, Archives of General Psychiatry, 55 (Feb 1998), 145-152. These last five are studies showing that the drugs shrink frontal lobes, and cause an enlargement in the basal ganglia. Please see the Gur MRI study in which she notes that this enlargement of the basal ganglia were associated with greater severity of symptoms. In other words, we have here an MRI study that charts brain changes that lead to greater severity of symptoms. Lehtinen V., Aaltonen J., Koffert T., Rakkolainen V., Syvalahti E., [PDF] Two-year outcome in first episode psychosis treated according to an integrated model. Is immediate neuroleptisation always needed?, European Psychiatry, 15 (August 2000), 312-20. This study by Finnish investigators compared outcomes for first-episode patients who were all treated with comprehensive psychosocial care, but were randomized into either an experimental group that was treated without neuroleptics (or a minimal dose), or a control group treated with standard doses of the drugs. In the experimental group, 42.9% of the patients did not receive any neuroleptics at all during the two-year period (versus 5.9% in the control group.) They concluded that "the main result was that the outcome of the experimental group was equal or even somewhat better than that of the control group." This, then, is yet another study showing good outcomes in first-episode patients treated with minimal or no neuroleptics. John Geddes, "Prevention of Relapse in Schizophrenia," New England Journal of Medicine, 2000, 346 (1): 56-58. In this review of a relapse trial comparing risperidone to haloperidol, the author notes that one-year relapse rates were 34% for those treated with risperidone, and 60% in the haloperidol patients, and concludes that this is evidence of risperidone's efficacy in preventing relapse. However, there is a missing piece in the author's review. What are relapse rates for patients gradually withdrawn from their neuroleptics? Harvard researchers found that the relapse rate for such patients was 35% over a six-month period, and that after that initial six-month period, the risk of relapse was quite low. In other words, risperidone in this trial produced relapse rates similar to rates seen in patients gradually withdrawn from their drugs. Moreover, as the author notes in this review, the drop-out rate in the trial was high. When this and other limiting factors were considered, the author concludes, "the treatment benefit associated with risperidone would probably be smaller in routine clinical practice." If so, that means that relapse rates with risperidone would likely be higher than rates in patients gradually withdrawn from antipsychotic medictions. Philip Seeman, "Rapid Release of Antipsychotic Drugs From Dopamine D2 Receptors," American Journal of Psychiatry, 1999, 156 (6):876-884. This paper looks at the cause of extremely high relapse rates for patients withdrawn from clozapine and quetiapine, which they note is "five times higher" than relapse rates for patients withdrawn from typical neuroleptics. The critical point here is that withdrawal from the atypicals may be even more problematic than withdrawal from typical neuroleptics. For further information on chronic illness and neuroleptics, see The WHO Studies. It is well known that standard neuroleptics cause tardive dyskinesia (TD). However, TD is usually thought of as a disorder that is limited to motor dysfunction. The citations below are simply a sampling of studies which have found that standard neuroleptics induce brain changes that lead to a more global decline. E. Christensen. "Neuropathological investigations of 28 brains from patients with dyskinesia," Acta Psychiatrica Scandinavica, 46, (1970), 14-23. TD patients have structural abnormalities in the basal ganglia, enlarged ventricles, and sulcal markings. E.B. Nielsen, "Evidence for cell loss in corpus striatum after long-term treatment with a neuroleptic drug (flupenthixol) in rats," Psychopharmacology, 59 (1978), 85-89. In rat studies, neuroleptics shown to cause loss of neurons in striatum. O.O. Famuyiva, "Tardive dyskinesia and dementia," British Journal of Psychiatry, 135 (1979), 500-504. TD associated with cognitive impairment. J.T. Wegner, "Cognitive impairment in tardive dyskinesia," Psychiatry Research, 16 (1985), 331-337. James Wade, "Tardive Dyskinesia and Cognitive Impairment." Biological Psychiatry, 22 (1987), 393-395. Association between TD and cognitive impairment. "The relationship appears to be linear: individuals with severe forms of the disorder are most impaired cognitively." J.L. Waddington. Cognitive dysfunction, negative symptoms, and tardive dyskinesia in schizophrenia. Archives of General Psychiatry, 44 (1987), 907-912..
TD associated with cognitive impairment and worsening of negative symptoms. J.B. Wade, "Cognitive changes associated with tardive dyskinesia," Neuropsychiatry, Neuropsychology, and Behavioral Neurology, 1 (1989), 217-227. TD associated with cognitive impairment. The researchers conclude: "TD may represent both a motor and dementing disorder." R. Yassa. "Functional impairment in tardive dyskinesia: medical and psychosocial dimensions." Acta Psychiatrica Scandinavica, 80, (1989), 64-67. TD associated with gait, speech difficulties, and psychosocial impairment. D.V. Jeste, "Study of neuropathologic changes in the striatum following 4, 8 and 12 months of treatment with fluphenazine in rats," Psychopharmacology, 106 (1992), 154-160. This study found a lower density of large neurons in the striatum of "middle-aged" rats given neuroleptics. Michael S. Myslobodsky. "Central Determinants of Attention and Mood Disorder in Tardive Dyskinesia (Tardive Dysmentia.)" Brain and Cognition, 23 (1993), 88-101. TD patients lose the motor part of their "road map of consciousness." TD may represent "larval dementia." Herbert Spohn, "The effect of attention/information processing impairment of tardive dyskinesia and neuroleptics in chronic schizophrenics." Brain and Cognition, 23 (1993), 28-39. Jacinthe Baribeau, "Tardive dyskinesia and associated cognitive disorders: a convergent neuropsychological and neurophysiological approach," Brain and Cognition, 23 (1993), 40-55. TD associated with cognitive dysfunction. John Waddington, "Cognitive dysfunction in schizophrenia: organic vulnerability factor or state marker for tardive dyskinesia?" Brain and Cognition, 23 (1993), 56-70. After reviewing 22 studies from 1979 to 1991, Waddington concluded that patients with TD were cognitively impaired on a variety of measures, which include learning, memory, cognitive function, intellectual function, visual retention, orientation, etc. James Wade, "Factors related to the severity of tardive dyskinesia," Brain and Cognition, 23 (1993), 71-80. A review of research shows that "biochemical and neuropathological changes associated with TD indicates that similar alterations are associated with Huntington's disease and or Parkinson's." The researchers also concluded that "cortical dysfunction, characterized by impairment in nonverbal function, is associated with TD severity." Emmanuelle Pourcher, "Organic brain dysfunction and cognitive deficits in young schizophrenic patients with tardive dyskinesia." Brain and Cognition, 23 (1993), 81-87. This is a study of patients under 40. The researchers conclude that TD is associated with cerebral dysfunction, which in turn is associated with degree of exposure to neuroleptic drugs. Thomas Gualtieri. "The problem of tardive akathisia," Brain and Cognition, 23 (1993), 102-109. Gualtieri writes that akathisia may be thought of as a disease of the basal ganglia, much like Parkinson's, Huntington's and Wilson's disease. MRI studies have found basal ganglia lesions in TD patients, especially in the caudate nucleus. Basal ganglia diseases all cause behavioral instability and intellectual impairment (even psychosis and dementia). Miranda Chakos, "Increase in Caudate Nuclei Volumes of First-Episode Schizophrenic Patients Taking Antipsychotic Drugs." American Journal of Psychiatry, 151 (1994), 1430-1435. Chakos finds that neuroleptics cause hypertrophy of the caudaute nucleus in the brain. "Caudate volumes increased 5.7% in the patients during the 18-month treatment interval . . . greater amounts of antipsychotic medication received by patients and younger age at the time of the first scan were associated with larger increases in caudate volume." J.S. Paulsen, "Neuropsychological impairment in tardive dyskinesia," Neuropsychology, 8, (1994), 227-241. These researchers reviewed 31 studies that compared cognitive function in schizophrenics with and without TD. In 24 studies, TD patients were found to do worse. The more severe the TD, the greater the impairment in cognitive function. The researchers concluded that "TD involves an alteration of brain function that affects both motor and cognitive control." P. Sachdev, "Negative symptoms, cognitive dysfunction, tardive akathisia and tardive dyskinesia." Acta Psychiatrica Scandinavica, 93 (1996), 451-459. Both tardive akathisia (TA) and TD are associated with more cognitive deficits and negative symptoms. This association is stronger with TA than with TD. The implication is that movement disorders seen in TA and TD are "but one feature of complex syndromes that include motor and cognitive features. A comparison must be made with other movement disorders, such as Parkinson's disease and Huntington's disease, in which neuropsychological deficits, and indeed subcortical dementia are known to occur." John Waddington, "Cognitive dysfunction in chronic schizophrenia followed prospectively over 10 years and its longitudinal relationship to the emergence of tardive dyskinesia," Psychological Medicine, 26 (1996), 681-688. Progressive deterioration in cognitive function is seen even late in chronic phase of schizophrenic illness. Deterioration derives primarily from emergence of TD. The researchers found that marked deterioration in cognitive function occurs at same time as emergence of TD-related movement disorders. Rupert McShane, "Do Neuroleptic Drugs Hasten Cognitive Decline in Dementia? Prospective Study with Necropsy Follow Up," British Medical Journal, 314 (1997), 266-270. The decline in cognitive function in dementia patients who take neuroleptics is twice the decline in patients who did not take the drugs. Raquel Gur, "Subcortical MRI Volumes in Neuroleptic-Naive and Treated Patients with Schizophrenia." American Journal of Psychiatry, 155 (1998),1711-1717. Neuroleptics cause hypertrophy of the caudate, putamen, and thalamus, which is thought to be "structural adaptation to receptor blockade." The drug-induced hypertrophy is also "associated with greater severity of both negative and positive symptoms." Raquel Gur, "A follow-up of magnetic resonance imaging study of schizophrenia." Archives of General Psychiatry, 55 (1998), 145-151. Use of neuroleptics is associated with volume reduction (or atrophy) of frontal lobes and temporal lobes. As the brain atrophies in this way, there is an improvement in delusions and thought disorder. A greater rate of reduction in volume is associated with higher dose. At the same time, reduction in volume is associated with decline in some neurobehavioral functions. Al Madsen, "Neuroleptics in progressive structural brain abnormalities in psychiatric illness." The Lancet, 352 (Sept. 5, 1998), 784-785. Neuroleptic use is associated with atrophy of cerebral cortex. The estimated risk of atrophy increases by 6.4% for each additional 10 grams of neuroleptic drug. G. Tsai, "Markers of glutamergic neurotransmission and oxidative stress associated with tardive dyskinesia." American Journal of Psychiatry, 155 (1998), 1207-1213. This study suggests that neuroleptics cause neuronal damage as a result of oxidative stress, and that this is the degenerative process that produces TD. L.D. Selemon, "Increased volume and glial density in primate prefrontal cortex associated with chronic antipsychotic drug exposure," Biological Psychiatry, 46 (1999), 161-172. In experiments with rhesus monkeys, the researchers found that "glial proliferation and hypertrophy of the cerebral cortex is a common response to antipsychotic drugs." C. Arango, "Relationship awareness of dyskinesia in schizophrenia to insight into mental illness," American Journal of Psychiatry, 156 (1999), 1097-1099. O.A. Andreassen, "Neurotoxicity associated with neuroleptic-induced oral dyskinesias in rats. Implications for tardive dyskinesia?" Prog. Neurobiology, 5 (2000), 525-541. In experiments with rats, there is evidence that drugs induce "striatal neurodegeneration" that leads to TD. J.B. Lohr, "Neuroleptic-induced striatal damage in rats: a study of antioxidant treatment using accelerometric and immunocytochemical methods," Psychopharmacology, 148 (2000), 171-179. In experiments with rats, researchers found that long-term neuroleptic treatment is associated with a reduction in cholinergic neurons in the striatum, and that this striatal damage is due to drug-induced oxidative stress. Simone Silvestri, "Increased dopamine D2 receptor binding after long-term treatment with antipsychotics in humans: a clinical PET study," Psychopharmacology, 2000, 152 (2):174-180. The researchers found that both typical and atypical antipsychotics caused a significant increase in dopamine D2 receptors in the striatum, and that this increase is associated with tardive dyskinesia. The atypicals, then, were found to cause the same pathological changes in brain structure that made the older drugs so problematic. Paul Thompson, "Mapping adolescent brain change reveals dynamic wave of accelerated gray matter loss in very early-onset schizophrenia," PNAS, 2001, 98 (20):11650-11655. The authors reported that adolescents diagnosed with schizophrenia suffered an accelerated loss of gray matter in their brains over a five-year period in comparison with healthy controls. (The brain scans showed gray matter loss in the healthy controls over this period as well, but not to the same degree.) The authors concluded that this was evidence of an underlying disease process central to schizophrenia. However, another way to look at the data is that it provides evidence that the drugs cause such accelerated loss of gray matter. There is also more to be drawn from the study data. At the end of five years, the schizophrenia patients had deteriorated in terms of a "global assessment of function," and the adolescents with a milder form of psychosis also hadn't improved on this outcome measure either. Thus, none of the adolescents placed on antipsychotic medications in this study fared well--they suffered an accelerated loss of gray matter (for whatever reason), and their overall functioning either deteriorated or remained roughly the same. Mantosh Dewan, "The clinical impact of the side effects of psychotropic drugs," in The Limits of Biological Treatments for Psychological Distress, Lawrence Erlbaum Associates, 1989, 189-234. See Dewan for death rates due to neuroleptic malignant syndrome. John Waddington, "Mortality in Schizophrenia," British Journal of Psychiatry, 173 (1998), 325-329. Researchers followed a cohort of 88 patients, ages 25 to 89, over a 10-year period. Thirty-nine patients died over this period. Reduced survival was associated with the administration of two or more neuroleptics at the same time, and time since withdrawal of antipsychotics (over time, patients kept on drugs became burdened with chronic physical illness, so much so that it replaced the "psychiatric disorder as the primary focus of medical care.") The final pathway to early death was global medical decline and death from respiratory illness. Louis Appleby, "Sudden unexplained death in psychiatric in-patients," British Journal of Psychiatry, 176 (2000), 405-406. Neuroleptics may cause sudden death by inducing cardiac arrhythmias and QT prolongation. Thioridazine is seen as particularly hazardous in this regard. Javier Ballesteros, "Tardive dyskinesia associated with higher mortality in psychiatric patients," Journal of Clinical Psychopharmacology, 20 (2000), 188-194. Patients with TD are at increased risk of early death. The evidence of an association between use of neuroleptics and poor long-term outcomes can be seen most clearly in studies by the World Health Organization. A long-term outcomes study by researchers at Harvard Medical School similarly found poor long-term outcomes in the era of neuroleptics. J. Leff, [PDF] The International Pilot Study of Schizophrenia: five-year follow-up findings, Psychological Medicine, 22 (1992), 131-145. The first World Health Organization study that compared schizophrenia outcomes in "developed" and "developing" countries was called The International Pilot Study of Schizophrenia. It began in 1968, and involved 1202 patients in nine countries. At both two-year and five-year follow-ups, the patients in the poor countries were doing much better. The researchers concluded that schizophrenia patients in the poor countries "had a considerably better course and outcome than (patients) in developed countries. This remained true whether clinical outcomes, social outcomes, or a combination of the two was considered." Two-thirds of the patients in India and Nigeria were asymptomatic at the end of five years. The WHO investigators, however, were unable to identify a variable that explained this notable difference in outcomes. Assen Jablensky, [PDF] Schizophrenia: manifestations, incidence and course in different cultures, A World Health Organization ten-country study, Psychological Medicine, suppl. 20 (1992), 1-95. The second WHO organization study of this type was called the Determinants of Outcome of Severe Mental Disorders. It involved 1379 patients from 10 countries, and was designed as a follow-up study to the International Pilot Study of Schizophrenia. The patients in this study were first-episode patients, and 86% had been ill fewer than 12 months. This study confirmed the findings of the first: two-year outcomes were much better for the patients in the poor countries. In broad terms, 37 percent of the patients in the poor countries (India, Nigeria and Colombia) had a single psychotic episode and then fully recovered; another 26.7% of the patients in the poor countries had two or more psychotic episodes but still were in "complete remission" at the end of the two years. In other words, 63.7% of the patients in the poor countries were doing fairly well at the end of two years. In contrast, only 36.9% of the patients in the U.S. and six other developed countries were doing fairly well at the end of two years. The researchers concluded that "being in a developed country was a strong predictor of not attaining a complete remission." A. Jablensky, N. Sartorius, J.E. Cooper, M. Anker, A. Korten and A. Bertelsen, [PDF] Culture and Schizophrenia: Criticisms of WHO studies are answered, British Journal of Psychiatry, 165 (1994), 434-436. J.D. Hegarty, "One hundred years of schizophrenia: a meta-analysis of the outcome literature," American Journal of Psychiatry, 151 (1994), 1409-1416. At the same time that the WHO was reporting on poor outcomes in developed countries, Harvard Medical School researchers published a study concluding that outcomes for schizophrenia patients in the U.S. had declined since the 1970s, to the point they were no better than they had been in 1900. They found that since 1986, only 36.4% of patients in the U.S. have had favorable outcomes (or were "improved" during a follow-up period that averaged 5.6 years.) The Harvard researchers did not blame neuroleptic use for the poor outcomes; on the contrary, they argued that despite the poor outcomes in the modern era, neuroleptics still should be seen as beneficial. Jean-Luc Martinot, "Striatal D2 dopaminergic receptors assessed with positron emission tomography and bromospiperone in untreated schizophrenic patients," American Journal of Psychiatry, 127 (1990), 44-50. Lars Farde, "D2 dopamine receptors in neuroleptic-naive schizophrenic patients," Archives of General Psychiatry, 47 (1990), 213-219. Jarmo Hietala, "Striatal D2 dopamine receptor characteristics in neuroleptic-naive schizophrenic patients studied with positron emission tomography," Archives of General Psychiatry, 51 (1994), 116-123. Larry Tune, "Dopamine D2 receptor density estimates in schizophrenia: a positron emission tomography study with c-n-methylspiperone," Psychiatry Research, 49 (1993), 219-235. This timelines provides a summary of research documenting the harmful effects from standard neuroleptics. psychiatrists use chlorpromazine as part of a drug cocktail that can put mental patients into "hibernation"
Tardive dyskinesia is said to resemble Huntington's disease, or "postencephalitic brain damage"
Canadian researchers describe drug-induced changes in the brain that make a patient more vulnerable to relapse, which they dub "neuroleptic induced supersensitivity psychosis"
TD found to be associated with cognitive impairment. Relapse in patients on injectable fluphenazine found to lead to "severe clinical deterioration"
"Quality of life" in drug-treated patients reported to be "very poor"
MRI studies show that neuroleptics appear to cause hypertrophy of the caudate, putamen, and thalamus, with the increase "associated with greater severity of both negative and positive symptoms"
Robert Whitaker's, [PDF] The case against antipsychotic drugs: a 50-year record of doing more harm than good, Medical Hypotheses 62 (2004), p. 5-13, is the academically written presentation of the information in "Mad In America: Bad Science, Bad Medicine and the Enduring Mistreatment of the Mentally Ill". The article was cited in the [PDF] British Medical Journal, 328/414 (February 2004). Most of the above research papers were analyzed in these publications.